Unless it was Pope Francis (aka Cardinal Jorge Mario Bergoglio) who appointed Rev.-Fr. Anthony Afful-Broni, both as a faculty member of the Winneba-based University of Education (UEW) and presently as Vice-Chancellor of the same tertiary institution or establishment, then it is absolutely preposterous and nothing short of plain arrogance for the National Democratic Congress’ Parliamentary Minority to call for the Sovereign of the Vatican or the Holy See to recall and reassign the American Jesuit-trained Prof. Afful-Broni (See “NDC Wants Pope Francis to Reassign Afful-Broni Over UEW Impasse” Modernghana.com 3/30/19). My five-year Roman Catholic secondary school education tells me that such role, or the say-so on whether Prof. Afful-Broni gets removed and/or reassigned from his present position, properly belongs to either the Head or President of the Ghana Catholic Conference or the Most Senior Bishop or Archbishop or Cardinal of the local Ghanaian branch of the global Roman Catholic Church. The perennially and pathologically obstreperous NDC Minority MPs ought to have done some meticulous research before so unwisely deciding to unforgivably embarrass Ghanaians, both at home and abroad, with such lame-brained demand. And, by the way, who told these NDC Parliamentarians that they have been afforded the mandate by the Ghanaian electorate to decide who runs or administers any of the public tertiary academies in the country? This was precisely what the Rev.-Fr. Emmanuel Abbey-Quaye sought to tell the Haruna Iddrisu Gang, when the Cape Coast Diocesan Cleric poignantly and instructively observed that the global Roman Catholic Church was rather too vast and functionally complex for Pope Francis to micromanage. But, of course, for this author, what matters most here is the fact that these parliamentary opposition leaders have not provided any intelligent or constructive reasons for their call for the removal or resignation of Vice-Chancellor Afful-Broni, other than the rather dubious grievance that since the latter’s assumption of the Vice-Chancellorship of the UEW, more than 30 staff and faculty members of the university have either been sacked or relieved of their duties or been demoted for reasons not specifically or properly explained to the members of the general public by these NDC politicians. 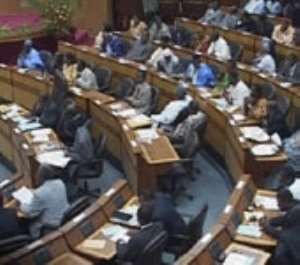 Until such an explanation is offered the Ghanaian public, the NDC’s Minority MPs may, at best, be legitimately perceived as a bunch of self-tutored ignoramuses blindly and puerilely pushing their own clearly unwarranted agenda dogmatically, when what they ought to be authoritatively discussing are the merits or demerits of the policy initiatives proposed and implemented by the new UEW Vice-Chancellor and his staff of university administrators. I have said this before and hereby repeat the same, that if Prof. Mawutor Avoke, the previous UEW Vice-Chancellor, had been appointed by the last NDC government or regime that was headed by former President John Dramani Mahama, rather than him having been collegially or democratically and meritoriously appointed by the UEW’s Council or the relevant internal legal authority traditionally and legally charged with doing so, then there is absolutely nothing that the NDC’s Parliamentary Minority can do about the same. In essence, even as the immortalized Nigerian Afro-jazz Maestro, Fela Ransome Kuti, would have said, “It is just another routine and simple case of ‘Soldier Go, Soldier Come.’” One does not suppose these NDC operatives to envisage themselves to be innately endowed with superior legislative powers than their New Patriotic Party (NPP) Parliamentary Majority colleagues and political opponents. So far, Rev.-Fr. Abbey-Quaye, of the Cape Coast Diocese, has noted that the UEW is functioning much better under the tenure of Vice-Chancellor Afful-Broni than it did under the previous Avoke regime. As well, as of this writing, Vice-Chancellor Afful-Broni was reported to have received a summons from Parliamentary Speaker Aaron Michael Oquaye, a Professor-Emeritus and former Dean of the University of Ghana’s Faculty of Law and an astute political scientist in his own right, who must appreciate how a real-adult major university is administered far better than any of these largely wet-eared half-educated National Democratic Congress’ Parliamentary Minority. In other words, Prof. Oquaye is in a much better-informed position to assess the fact of whether, indeed, Prof. Afful-Broni has, so far, been an asset or a liability to the UEW. As for the question of some UEW students having embarked on three demonstrations on campus in support of either fired or demoted faculty and staff members of the university, it is neither here nor there. It really does not reliably inform the general public as to whether these employees were either qualified or not qualified for their jobs. It is just a routine matter of political solidarity and fanfare, one that is strikingly similar to the professional and moral support declared by the executive operatives of the University Teachers’ Association of Ghana (UTAG). We must also emphatically note here that relative to the administration of the country’s public education system, the leaders of the ruling New Patriotic Party are far better and more trustworthy trustees of the future well-being of our youths, the proverbial leaders of tomorrow, than their corner-cutting National Democratic Congress’ counterparts. This author has authored 4469 publications on Modern Ghana.